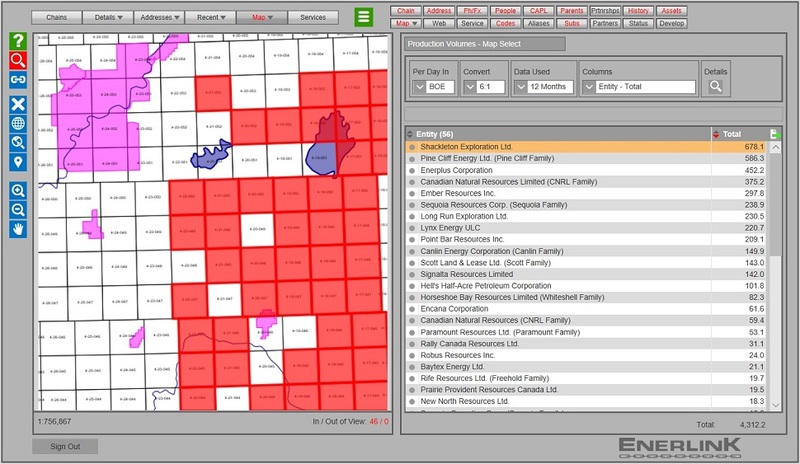 The majority of oil and gas operations in Canada are conducted by companies that subscribe to EnerLink, an online database of corporate genealogy, asset transactions, production and mineral land information, directors, officers, addresses, websites, phone and fax numbers, parents, subsidiaries, partners, partnerships, trade names, aliases, government codes and more. At Subscribers you can see that our clients include numerous startups, producers of all sizes, midstream companies, energy marketers, pipeline companies, utilities, oilfield service providers, law firms, seismic brokers, land agents, data providers and government departments. 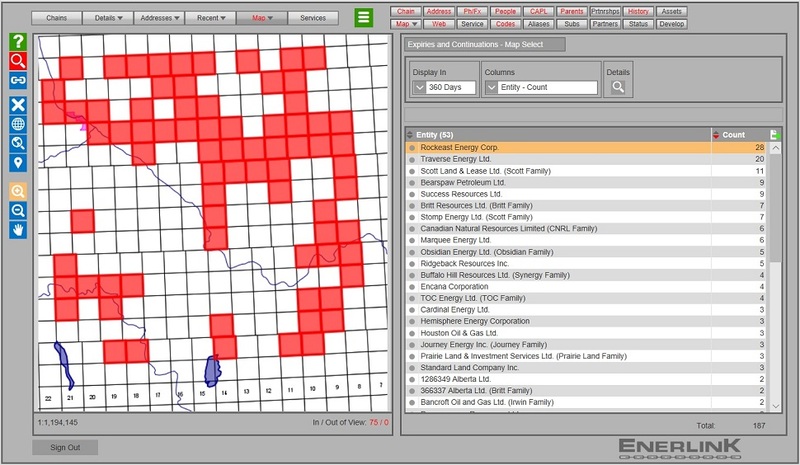 EnerLink is used in many departments: A & D, accounting, mineral land, surface land, exploration, joint ventures, geophysical, legal, marketing and others. It helps identify business opportunities, improves decision making and results in significant administrative savings. Please check Features and Pricing for more information. The production module of our Profiles feature was recently released. 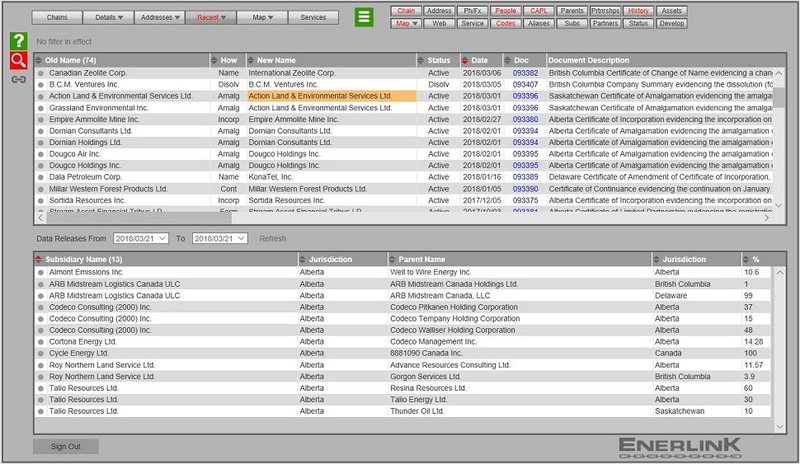 It permits EnerLink users to view, sort and filter production statistics and operating areas for hundreds of entities with operations in Canada, the U.S. and internationally. 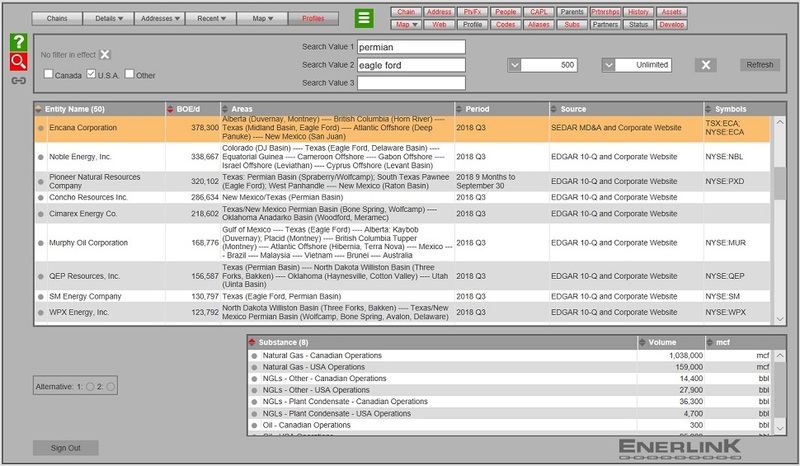 The non-production module will let EnerLink users view, sort and filter hundreds of non-producing entities that are relevant to industry, starting later in 2019. We are adding numerous U.S. entities to our database to better serve our Canadian clients who have operations south of the border. At some stage we will likely start marketing EnerLink to industry in the U.S.
We have made several changes to our pricing strategy to better accommodate any and all sizes and types of companies. EnerLink is now much more affordable for new subscribers and for companies with significant production yet few "third party issues". Please check Pricing to learn more. Chains Screen Precedessors, successors and asset transactions. View PDF copies of title documents. Print related reports. 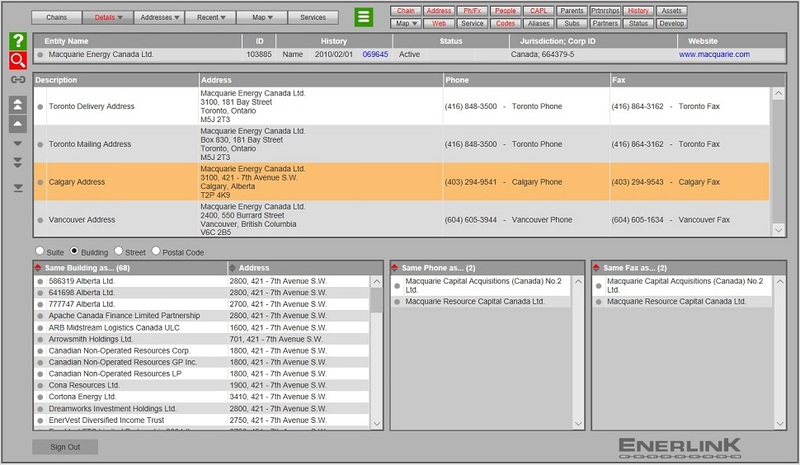 Profiles Production Screen Production statistics and operating areas for hundreds of entities with operations in Canada, the U.S. and internationally. Coming soon. 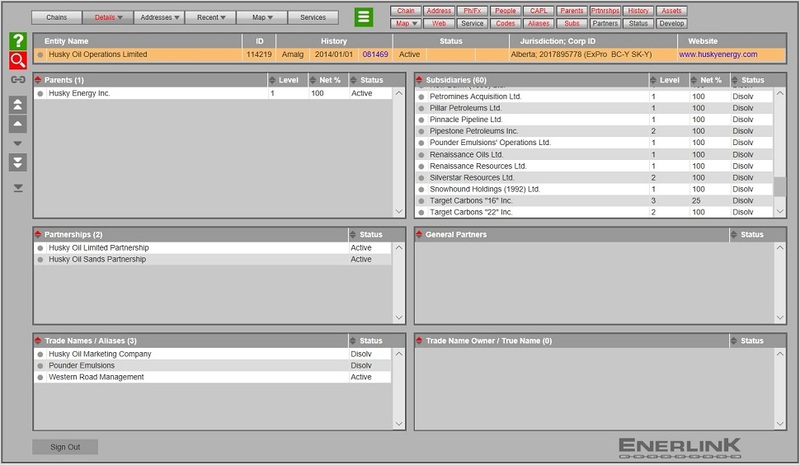 Map - Production Volumes Screen Working interest production. Search by Entity, Family, Lands, Field or Unit. Saskatchewan and B.C. to be added in 2019. 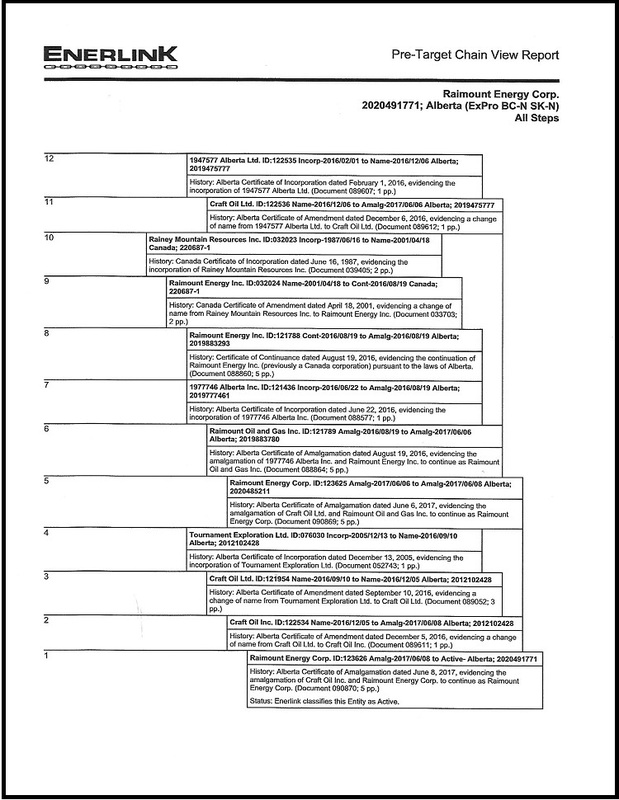 EnerLink Mineral Report For Alberta Energy and Indian Oil and Gas Agreements. 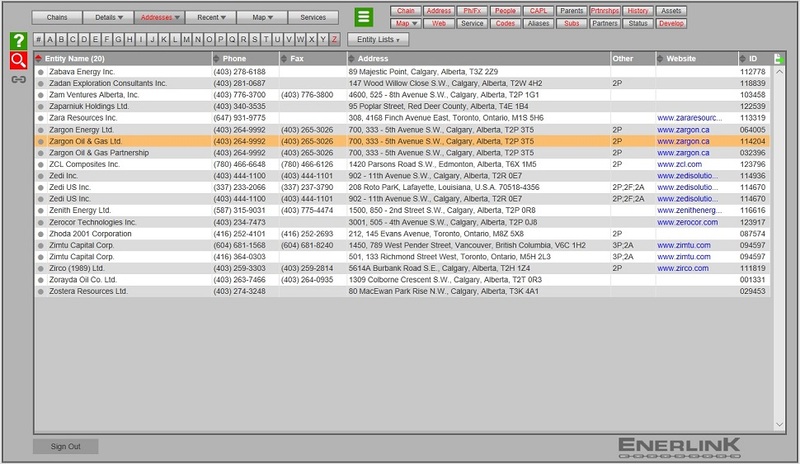 Addresses - Name Search Screen Thousands of addresses, phone and fax numbers, and websites. Data can be exported in Excel CSV format. 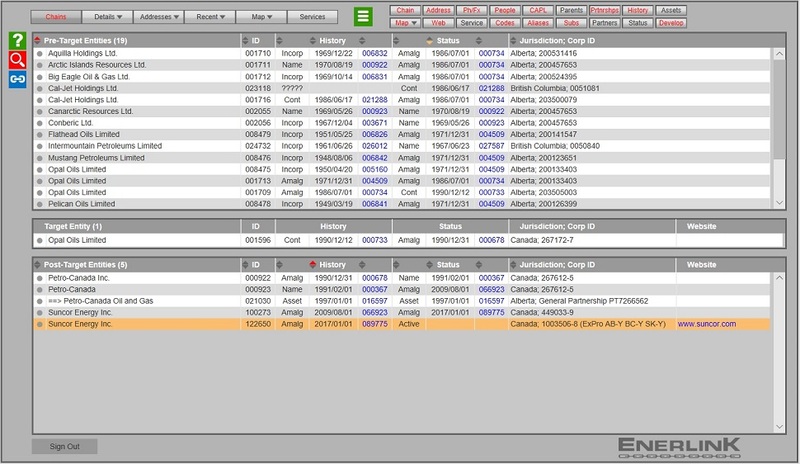 Details - Addresses Screen Detailed address information per Entity. Bottom half of screen shows related/nearby address, phone and fax information. 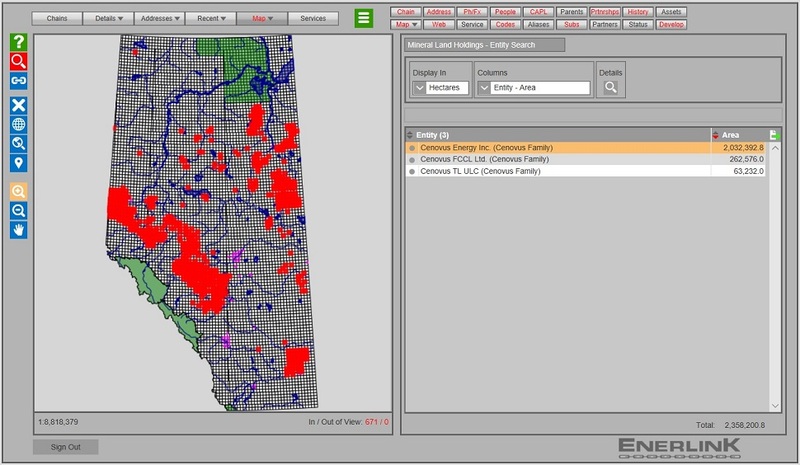 Map - Mineral Land Holdings Screen Search by Entity, Family or Lands. Drill down for Agreement details. Saskatchewan and B.C. to be added in 2019. 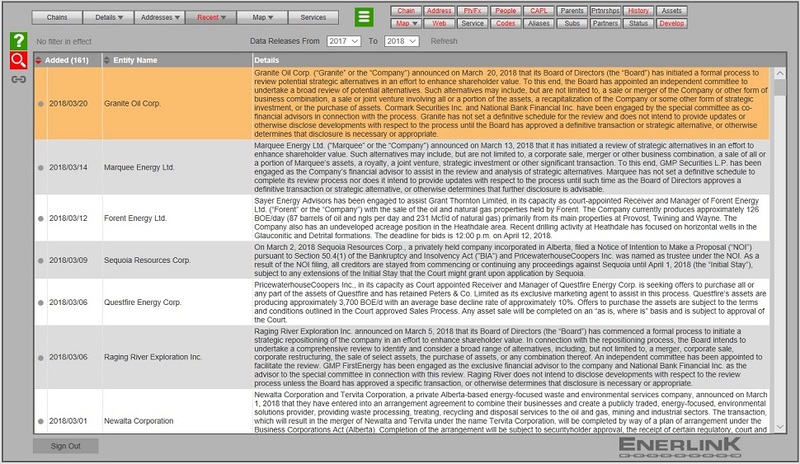 Recent Changes Screen Review title documents and parent/subsidiary relationships added to EnerLink over the past few weeks. Chain View Report A graphical representation of the history of an Entity, starting from the bottom right. Recent Developments Screen Press releases and similar back to 2011 pertaining to corporate deals, asset transactions, receiverships, etc. Searchable by Entity. 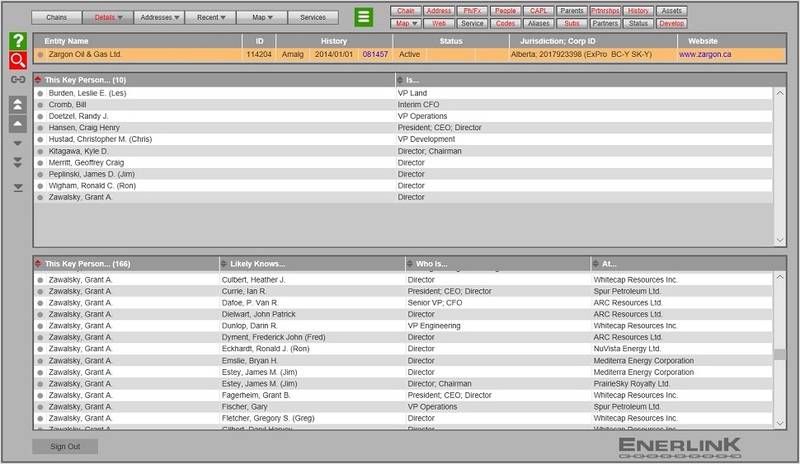 Details - Key People Screen 24,000+ directors and officers at 12,000+ companies. Bottom half shows "who works with who", for networking. 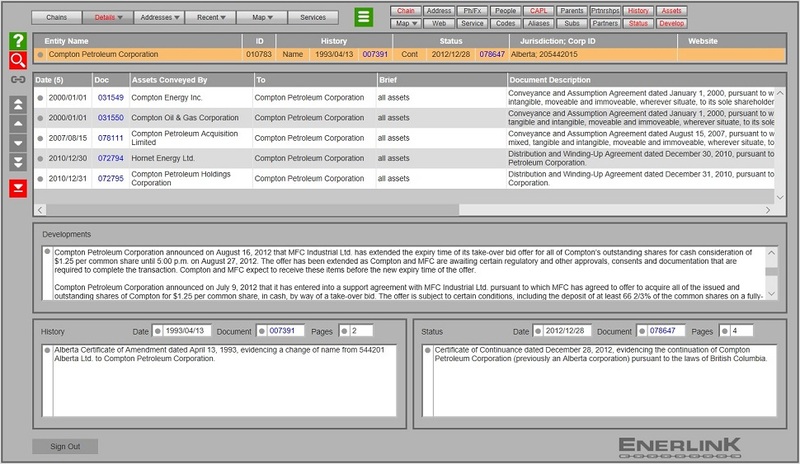 Details - Title Documents Screen History and Status title document details for an Entity. 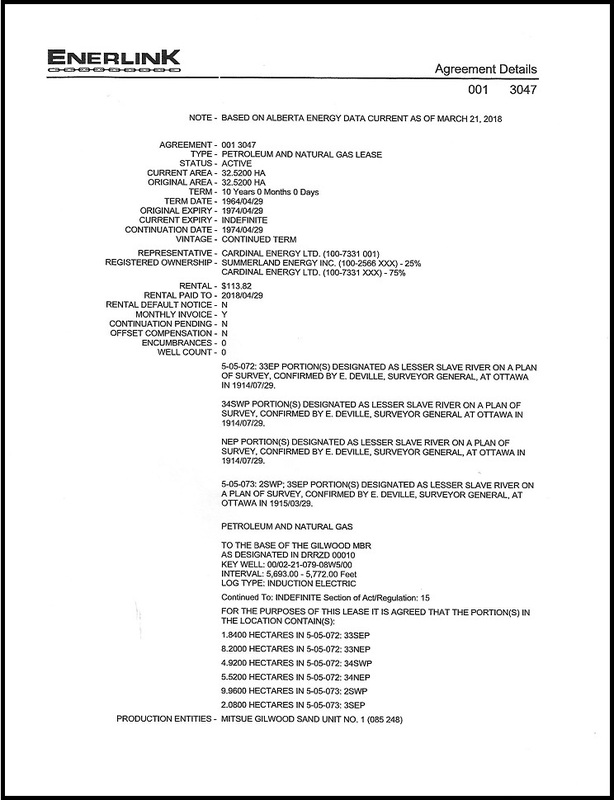 Also its asset documents, and its press releases back to 2011. Map - Expiries and Continuations Screen Search by Entity, Family or Lands. Filter by 180, 360 or 720 days. Drill down for Agreement details. 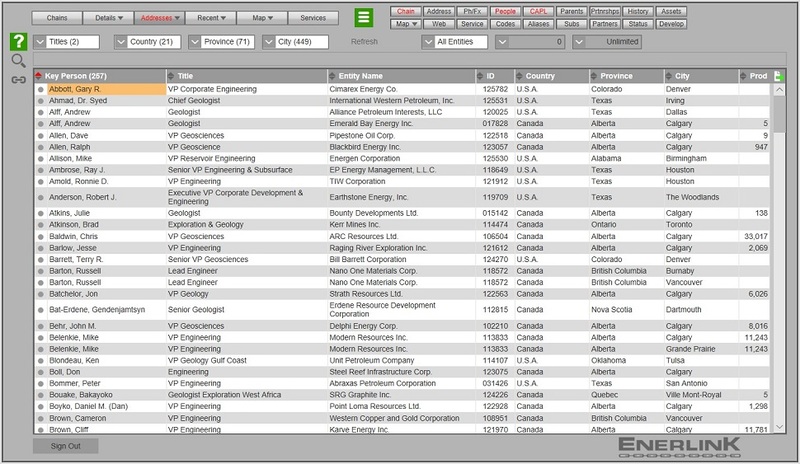 Details - Relationships Screen Parents, subsidiaries, partnerships, partners, trade names and aliases. Addresses - Title Search Screen Filter by job title and location, as well as by production in BOE/d. Data can be exported in Excel CSV format.